Staff at production and research laboratories use high-pressure steam inside an autoclave to sterilize or remove all microorganisms from plastic containers. These containers must be rated safe for an autoclave as some plastics, such as HDPE and polyethylene, will melt in the course of a standard autoclave run. For those looking to sterilize plastic containers at home, a standard microwave oven will do the trick. Of course, only microwave-safe plastics ought to be sterilized in this manner. Although not appropriate for home sterilization, plastic container sterilization can also be accomplished via ethylene oxide 'gas' sterilization, peracetic acid, ionizing radiation, dry heat, hydrogen peroxide gas plasma systems, ozone, formaldehyde steam, gaseous chlorine dioxide and infrared radiation. Fill a cup with 250 to 500 ml (about 1 to 2 cups) of water and place it in the microwave. This will act as a heat sink to ensure the plastic container inside the microwave doesn't get too hot and melt. Gather together the microwave-safe containers and lids that require sterilization. Microwave containers in a secondary container for at least 3 minutes on the highest setting. Remove secondary container for microwave with plastic containers inside, while maintaining sterility. Use insulated gloves, as the containers may be hot. Gather together autoclave-safe plastic containers and any lids that need sterilization. Lids can be loosely placed on top of containers. A tightly attached lid can cause a container to succumb to pressure within the autoclave and crack or explode. Place containers and lids in a secondary autoclave-safe container, making sure to leave space between containers. Place the secondary container in the autoclave and follow any standard operating procedures for your specific autoclave. The standard sterilizing autoclave run is at 121 degrees Celsius, 15 pounds per square inch of pressure for at least 30 minutes. Remove the secondary container from the autoclave using thick, insulated gloves to avoid burning. The surfaces will be extremely hot. When using heat to sterilize plastic containers, always make sure the plastic can withstand high temperatures. Always use personal protective equipment when working with high heat. Always be careful when working with pressurized systems. 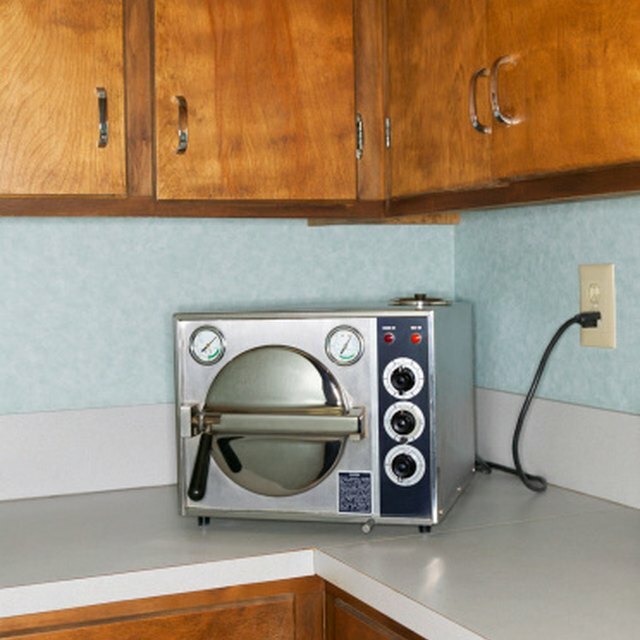 Make sure a licensed professional has inspected recently the autoclave you are using. Smith, Brett. "How to Sterilize Plastic Containers." Sciencing, https://sciencing.com/sterilize-plastic-containers-4793088.html. 02 May 2018.